If you like chocolate, thank the midges. These tiny flies (about 1 to 3mm) pollinate the intricate flowers of the cacao tree, Theobroma cacao. From those seed pods, known as cocoa beans, come the chocolate that we crave. In fact, we Americans consume 2.8 billion pounds of chocolate every year, or about 11 pounds per person, according to chocolatestore.com. For Valentine's Day, we purchase some 58 million pounds! The cacao tree thrives in parts of Central America, South America, Africa and Asia, but there's also one thriving in the UC Davis Botanical Conservatory, off Kleiber Hall Drive, UC Davis campus. You can see the "chocolate tree loaded with fruit" from noon to 4 p.m., Saturday, Feb. 16 during the eighth annual UC Davis Biodiversity Museum Day. The event showcases 13 museums or collections (see schedule for varyng times). It's a free, family friendly event, both educational and entertaining. 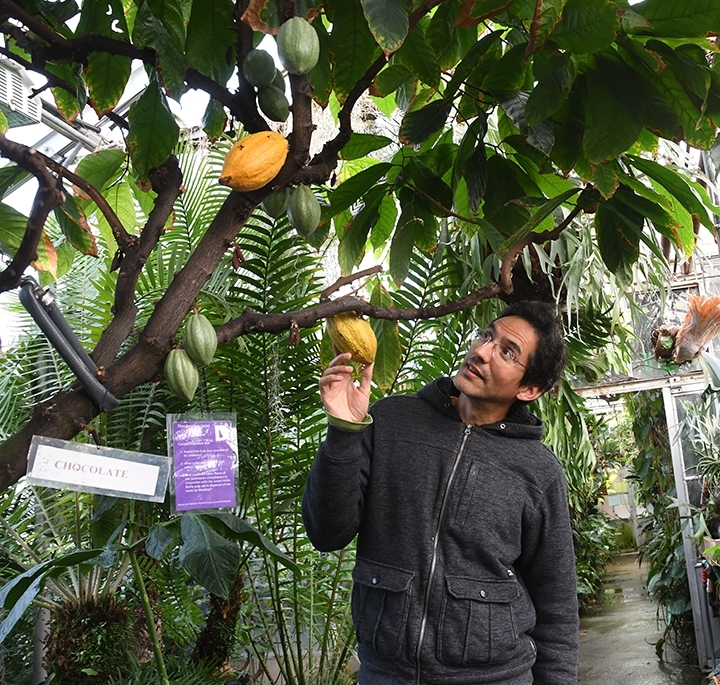 Ernesto Sandoval, collections manager for the Botanical Conservatory (part of the College of Biological Sciences Greenhouses, Department of Plant Biology), says the cacao tree is "upwards of 25 years old." How does it get pollinated? "Ours gets pollinated when we spray it down with water to wash away mealybugs." Sandoval and his staff plan to make chocolate (cocoa powder and chocolate are made from the dried seeds.) "I have just an inkling of how to make chocolate but one of our interns is working on trying to do this." Meanwhile back to the midges. The chocolate midges. Have we thanked them enough yet? 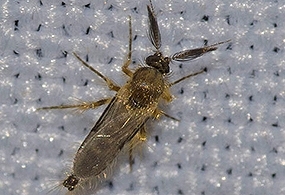 The National Park Service describes the chocolate midges as "very small flies with long, complicated names: Ceratopogonidae, various species of Forcipomyia and Euprojoannisia. No bigger than the size of pinheads, midges seem to be the only creatures that can work their way into the intricate flowers to pollinate. They are most active in their pollination duties at dusk and dawn, in sync with the cacao flowers, which fully open right before sunrise. Without the midges, there would be no chocolate!" And quite appropriately, Theobroma cacoa (named by Swedish botanist Carl Linnaeus in the 18th century) means "food of the Gods." Really, it's amazing that these tiny flies can pollinate the flowers at all. Ask an Entomologist says that "Oh, and the flies are bad at flying. Oh, and they can barely carry enough pollen to pollinate one flower. Oh, and each flower only typically lasts between 24-48 hours." Only one out of every 400–500 flowers produce fruit, according to Ask an Entomologist. The plant "can produce upwards 50,000-100,000 flowers in it's 25-year lifespan. On average, a tree can produce 100-250 fruiting pods over its life....Only 10-30% of the pods will make it to maturity. Each of the pods produces between 20-50 beans which are covered by a sweet flesh that is edible. Approximately 400 beans are required to make one pound of chocolate." "So let's max this all out and say you have a tree that produces all 250 pods in its life, 30% of the pods make it to maturity and all those pods produce 50 beans. That's 3,750 beans over its 25-year lifetime, which means one tree can make about a whole whopping 9 lbs. of chocolate." Even more reason to express our appreciation.